Go hiking. A good hike outdoors can make you happier and healthier. It lowers your blood pressure and can reduce your risk of diseases. Not to mention it can make you happy just by breathing in the fresh air and stretching your legs. Head to a local trail or drive to a new location and spend some time in nature. Make sure to bring a buddy or let someone know where you’ll be hiking to stay safe. Go for a walk or a run outside. 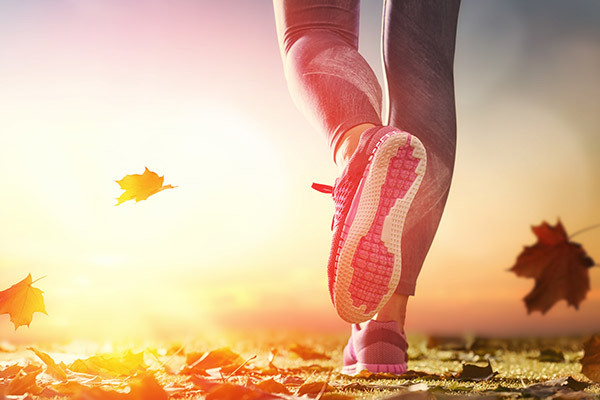 Fall has the perfect weather to go for a walk or a jog. It is cooler outside and the humidity starts to lower. Try a sunset yoga class. Yoga can be very relaxing and improve your balance and flexibility. If you’ve never taken an outdoor yoga class, you should try. Lots of studios offer free classes outdoors. Look for an outdoor flow class where you can watch an amazing sunset as you “om”. Act like a kid! If you have kids or grandkids, take them outside and play with them. Get out your old jump rope, throw a ball around the backyard or just play yard games. In the same vein, try some outdoor sports. Fall generally means football, but you could also play tennis, baseball, softball, lacrosse or other sports. It is a great way to get friends and family together and have a little friendly fall competition. Hit the water before it gets too cold. Try kayaking, canoeing, paddle boarding or swimming. These are great low impact activities that can give you a new view of the gorgeous fall foliage. What is your favorite way to workout outdoors? Do you enjoy being outside in the fall? If you enjoyed this article, please share with your friends and plan some fun fall workouts!